Kilogram for kilogram of working load, BB and RT Orbit Blocks™ are the world’s lightest. The unique orbital design allows the bearing to only be in the active areas of the floating sheave. This minimises the mass of the inactive return race and hub. The orbital ball-bearing arrangement gives the largest possible bearing race diameter. This maximises load performance. The proven Ronstan 2-stage bearing system features high compression grade acetal ball bearings and a secondary full-contact bearing. This gives minimum friction across the full working load range. 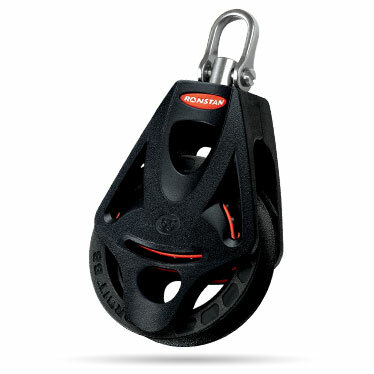 The floating sheave and bearing system is supported by a fibre-reinforced load frame. The design was computer modelled to be stress optimised. The Dyneema® Link is produced from FSE Robline SK75 fibre, which is 10 times stronger and lighter than steel, and provides the final connection from the block to the load point.